Fire pit is a great addition to your backyard or patio. To make this winter a special one, gift your home something as enchanting as a Fire pit. Whether it is to have a cozy evening, sipping on some hot chocolate with your partner or a barbecue party with the neighbors and friends, a fire pit is sure to make your winter an experience in itself. This holiday season; take that road trip you’ve always dreamt of or a camping expedition and never be worried about the cold. A fire pit is a perfect invention for all these outdoor activities. Wouldn’t it be wonderful to hum melodies gathered around a bonfire in your backyard? Or simply to watch the flames warm the air around while you share prolonged conversations with your near and dear ones? If you wish to create magical moments like these this winter, minus the hassle of wood and ash everywhere in your backyard, a fire pit is just what you need. The best thing about them is that you can take them with you without much trouble. This bronze fire pit is of bowl type and weighs 29lbs. It is 31″ in diameter and occupies a total of 36″ of total space. The design of this fire bowl is unique with a cross weaved texture. It comes with its own spark screen and all weather cover. The bowl itself is made of steel covered with high temperature resistive paint. The product comes with a one-year long warranty from the manufacturer. This is a medium-sized fire bowl perfect for backyards and medium-sized gardens. The Fire Sense Folding Fire Pit is your perfect outdoor heating companion when you are out for a camping trip. This 22″ fire pit has a number of accessories included in the product which is an absolute value for your money. It has a grate for cooking, and a fire tool included. No special tools are needed for its assembly. The most attractive feature is that the legs of this fire pit can be folded which makes it easy to port from one place to other. It also comes with its own carrying bag. If you are looking for a fire pit that has the appeal of a cauldron and is sure to start up a lot of conversations, look no further. This beauty is 30″ in diameter comes with a dome shaped cover. The tub is made of copper and is designed for larger and longer lasting fire. The design is contemporary and sturdy. The rustic look and cool texture will certainly not go unnoticed by your guests. The cover is provided with an elastic stretch band to ensure that it is secure and protects from anything entering the tub. The Landmann Big Sky Fire Pit is a 23.5″ fire bowl type fire pit which has interesting wildlife cutouts on the surface of the bowl. The patterns add to the aesthetic appeal. This is a perfect choice if you are planning to have a barbeque party. The fire bowl comes with a cooking grate that covers the bowl. The surface of the bowl has a black finish which makes it easy to clean and maintain. The first gas fuelled fire pit to feature on the list is the Endless Summer GAD860SP Gas Outdoor Fire bowl. This fire bowl is capable of providing heat to an area of 150 sq.ft. It generates 40,000 BTUs of heat. The design resembles that of a wood burning fire pit. The table is made up of multi colored slate and marble. This product comes with faux lava rocks and logs. 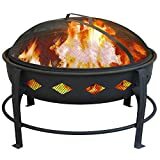 A unique selling point of this fire pit is the settings of mood or heat which make it ideal for backyards or camp sites. The ignition is quick and easy. The fire pit is 21.7*41.26*41.26″ in dimension. This 24″ fire bowl is a CSA approved fire bowl which is guaranteed to give you the feel of a natural campfire. With this approval, you can be sure about safety and quality. 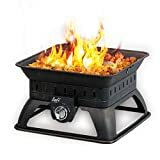 The fire bowl comes with a weather resistant cover that is durable. Its capacity is a massive 58,000 BTU. The product has a stainless steel burner and fasteners which are coated with high temperature powder coating and can withstand high temperatures. It is also ensured to be durable thanks to its protective enamel finish. The apparatus uses propane but can be converted to natural gas with separate accessories which are also available. The last fire pit to be featured on this list is the BCP Gas-powered Outdoor Fire Pit table which is a 20lbs. Propane powered fire pit. The fire pit is made of sturdy aluminum and fire glass making it one of the most durable fire pits available. The gas tank has a large door for easy access but is hidden underneath the table. The texture and color of the pit is beautiful and perfect for any space. It also comes with a lid that can be used when the pit is not in use. The design of the table itself is such that it can transform into a regular table when the lid is placed. The width of the pit is 45″ and comes with a nylon cover for protection against the weather. Fire pits can be broadly categorized into 3 sizes based on their dimensions. While each of these sizes has their own advantages, it is wise to understand the purpose for which you would want to use the fire pit and pick accordingly. Small fire pits: The fire pits that are about 22 to 24 inches in dimension are classified as small fire pits. 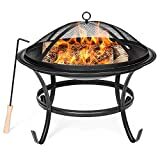 These fire pits are perfect for camping trips and small sized patios or semi enclosed barbecues. Since they are lightweight, they can be easily carried around. Generally, these designs have carrying cases or attached handles that make it convenient to transport. 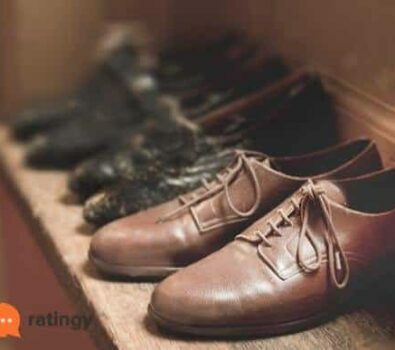 Due to their small size, they can also be stored indoors without occupying too much real estate. Medium sized fire pits: The fire pits that are anywhere between 30 inches to 36 inches in size are called medium sized. They hold more wood than the small fire pits and are usually built to withstand more heat. They are ideal if you wish to have a slightly larger fire. 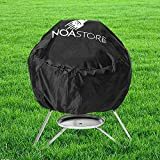 It is recommended for backyard barbecue parties and ideal for outdoor bonfire activities. Although they are bigger than the previous category discussed, they can still be ported from place to place. These designs usually come with a lid or screen for protection. The bowl itself is a more rugged and sturdy one made of a stronger material like cast iron or steel. Large sized fire pits: If you are hoping to create a dramatic ambiance that looks and feels majestic, large fire pits are for you. They are generally 40 inches to 45 inches wide and are ideal for parties and gatherings. Their size is best suited for medium to large sized back yards and outdoor spaces. They can easily become a conversation starter in all your winter get-togethers. They are usually designed to have a table like structure that can be used as a mini serving area. They are made of stone or copper or other sturdy materials. The amount of wood they can hold is quite appreciable and the flames and heat they generate simply can’t be missed. They are perfect to add some character to your otherwise simple yard or garden. The only downside to these fire pits is that they are bulky due to their size and may not be portable. Some of these may be permanent fixtures that you cannot transport easily. An important factor to consider while choosing a fire pit is the fuel that it uses. Some fire pits use wood to burn while others use gas. Wood Burning Fire Pits: Fire pits that use wood to burn and generate heat and flames generally cost less than the high end gas fuelled fire pits. They are also more appealing in terms of beauty and aesthetics. They create a real life experience with real flames. 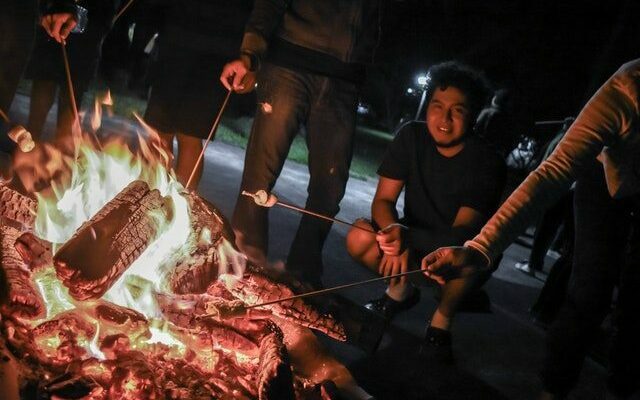 They are also perfect for roasting marshmallows or for barbequing. They have a conventional old world charm to them and add to the ambiance of the garden or yard. Having said all that, you must remember that they since they use wood, you will have to have a sufficient supply of firewood. It also means that you will need a dry place to store the wood. The ash disposal is also something that you need to take care of. The smoke released is also a concern. These also require a little time for the fire to start and roar up. But once kindled, the fire from the wood burning fire pit is sure to give you a great experience outdoors. Gas-powered Fire Pits: These fire pits are fuelled by gas and have decorative lava rocks and wood logs which are coated with heat resistive coating. Although the flame is real, it is generated by burning gas and not wood. They have a gas tank enclosed in an aluminum or steel housing that is concealed under the pit. They are available in plenty of designs that look like wood burning pits. They come with a mesh covering the burners to prevent clogging. They can be instantly started and put off which makes them convenient to use. They are also slightly more eco friendly. But these outdoor propane burner are expensive and the recurring gas costs are to be borne by you. It is desirable to have a protective screen or cover to prevent the sparks from straying. A lid might be handy when you are not using the fire pit. Some fire pits can be used as a barbecue and come with a custom grill. Some designs may have foldable legs and caskets to help you transport the fire pit. Since you may not use the fire pit through all seasons, it is important to look for options that come with anti corrosion coats. Heat resistance is also something to be considered. Apart from that, they need to be protected from rains and snow. 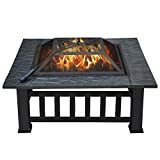 Since a fire pit basically is an outdoor heating set up that can use wood or other fuels to make fire, there are a variety of designs available commercially that you can choose from. A fire pit is no longer a simple hole dug in the ground to contain the fire from burning up the entire backyard. The contemporary designs are implemented keeping in mind the smart needs of the users. There has also been a huge advancement in the type of materials used for manufacturing these fire pits. Cast iron, copper, stainless steel are a few staples used in their manufacturing. The newer fire pits may also come with an attractive lid made of glass or similar translucent materials that adds to the aesthetics. The bowl itself may also be given a beautiful rustic or artistic touch. The choices out there are numerous and rest assure that there designs available in the market to suit everyone’s personal tastes. To give you a heads up, here are a few broad categories that you could choose from. If you are looking for a fire pit that doubles up as a barbeque, a fire bowl should be your first choice. These are bowls which come with a grill or grate for cooking. You could also purchase a grill of your choice that can be placed on the bowl according to your need. They are also small and portable making them ideal for smaller patios or backyards. Another design that can be used for multiple purposes, the fire pit table essentially consists of a fire pit mounted on table limbs structure. It allows your guests and family to use part of the fire pit as a table. They are an excellent choice for outdoor gatherings. Due to their compact setup, they are mess free and require little maintenance. The final type of design is for the lovers of art and patrons of aesthetics. If you have a distinctive style of your own and wish that the fire pit matches the décor of your home or if you simply want a fire pit that is aligned with your sense of style and personality, be sure to find plenty of artistic yet functionally sound designs for sale. From vintage, rustic to contemporary chic, you can choose from a wide range of artistic designs, and the list never ends. Read the instructions before you start up and stick to them. Be extra careful with wood burning fire pits and use the spark cover if provided. You can adjust the logs using a fire poker. Checking the gas tank and fittings is important every time before using a gas fuelled fire pit. Make sure you clean the ash and leftover wood. Never move the fire pit while it is still hot. Avoid proximity to trees and inflammable substances. Pay attention to the pit especially if around kids and pets.